You are here: Home / Topics / Recipes / Crockpot Recipes / 25 Meal Ideas For the Busy Baseball Season + Chicken Fried Rice Recipe in the Rice Cooker! By doing a quick google search, it’s very apparent that my family is not the only one spending most of our evenings at the baseball park in the spring. I’ve even found multiple pinterest boards dedicated to meal ideas for the busy baseball season. With 2 of my boys and my husband currently playing baseball, we’re at the diamonds anywhere from 4-5 evenings during the week. It’s great fun but it’s also difficult when practices and games all start at around 5-6pm… supper time. If you’ve had a chance to join my FREE, 28 day grace filled journey to real food (you can join at any time) and have started to make the transition to eating wholesome, nourishing foods, one of the things you’ll notice right away is that your digestive system becomes more sensitive to processed foods. Most of the foods sold at concession stands leave my family with upset stomachs so it has become very important for me to make sure to have meal ideas planned and prepared for the busy baseball season. 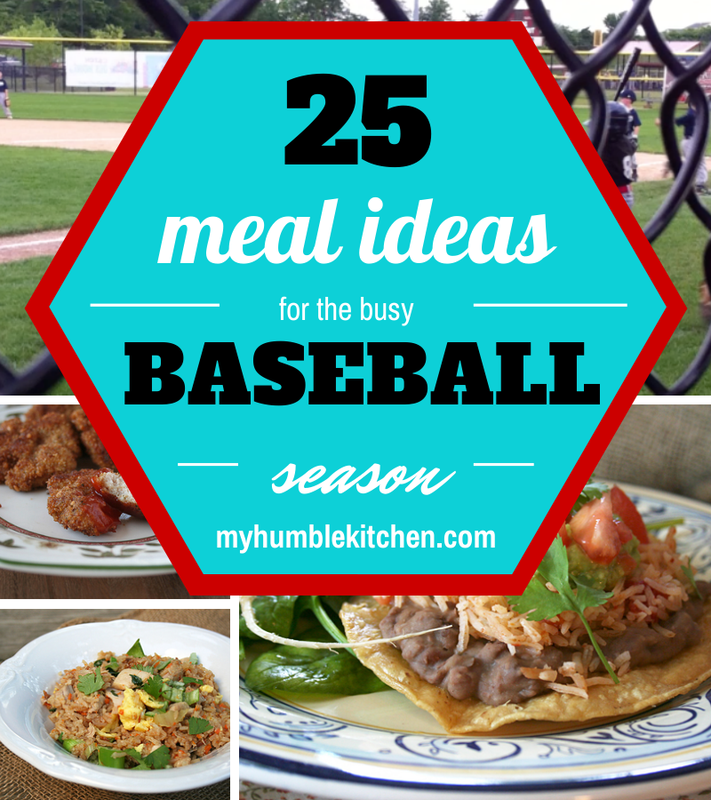 With many crazy baseball seasons under my belt, I wanted to share with you 25 meal ideas for the busy baseball season. They are all easy to make that come together quickly. I know how important that is especially when you’re arriving home late in the evening with kids that have burned a sweat and need to be re-fueled. I cook a lot of crockpot meals during this time of the year. They are SO easy to throw together in the morning and if you have a crockpot like this one, it will keep itself warm after its finished cooking. That feature is very important to me as my meals end up being in the crock over 8 hours on our days that we have ball games. I LOVE to make beans during the baseball season. Check out a few meal ideas that can be made with prepared beans below! Quick sandwiches, wraps, and tacos make meals come together quickly. With beans in the crockpot and Mexican rice in the rice maker, all you have to do is fry up a corn tortilla for a couple minutes on each side for a simple and quick meal during the busy baseball season. 11. BLT – Enough Said! To make these simple meat and bean burritos, all I do is make a batch of frijoles rancheros in my large crockpot and mexican rice in the rice cooker. In a smaller crockpot, I put in 1lb of ground beef and mix that together with 1 casing of Mexican chorizo sausage. When we get back from our evening games, all we do is assemble burritos. Bam… instant dinner! Many meals can be made ahead of time and frozen. Then on the day of your baseball game, you can easily place the meal directly from the freezer to into your crockpot right before you leave, set on low. When you get back from your game 2-3 hours later, it should be warmed up and ready to serve. If you’ve made a big batch of sloppy joes, to make another meal, simply throw in some potatoes into your crockpot set on high before you head out to your game. When you get back, the potatoes should be tender. All you need to do is add some sloppy joe sauce all over the potatoes and garnished with additional cheese, green onions, and sour cream. Super easy… super yummy! One of my favorite ways to prepare a quick meal is in the rice cooker. I never realized how versatile this machine can be. I own this Zujirushi rice cooker and it always makes the softest, fluffiest rice that stays warm until opened. I’ve started making a variety of meals using the rice cooker. I set it right before I leave for our evening baseball games and when we get back we have a warm and nourishing meal waiting for us. It’s great! My entire family loves this recipe. It’s super easy to make and the results are absolutely scrumptious. It really is the perfect meal to make before a busy evenings out as it will be warm and ready to eat upon your return. Chicken Fried Rice Recipe in the Rice Cooker! 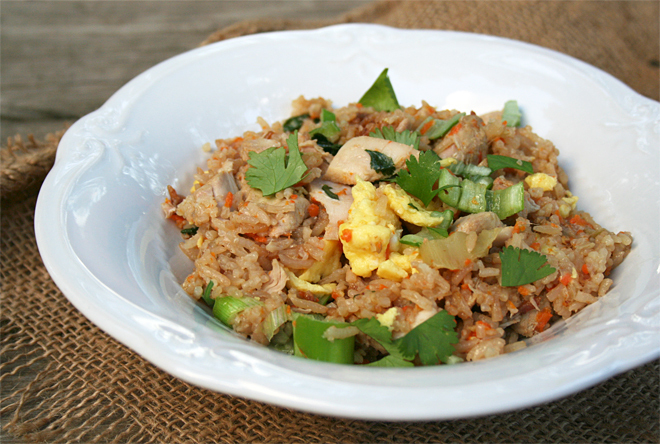 Chicken fried rice in the rice cooker is a simple meal to put together that cooks by itself. It's the perfect meal to make on busy evenings. Pour in the mixture from the bowl but DO NOT MIX. Cook the rice following the rice cooker’s instructions. When the rice is done cooking, add the rest of the spring onions, the cilantro, and the cooked scrambled eggs. Stir the rice to mix the ingredients. Does your family need meal ideas for the busy baseball season? Do you have any recipe ideas you’d like to share? Please share any tips, tricks, and recipes for quick and easy meals during busy days away in the comments below. Do you use cooked chicken thighs in the Fried Rice recipe? Thinking of trying this one out tonight. David, no it’s raw. Makes it super simple! I have two more – both of which couldn’t be easier! Cook on high for 4 hours-shred-serve with taco shells, tortillas, shredded lettuce, cheese, or any other veggies – guacamole- and rice! Patti, those recipes sound great! I’ll have to give them a try! Do you think jasmine rice would work as well as basmati? I just bought a large bag of jasmine rice. I love these ideas! Summer is a really busy time for us too, so quick and easy are essential. Pinning and sharing :). Well I think I have my meals planned out for the entire month. 🙂 Really great collection. Just my style. Diana, I’d love to give this a try. How much soy sauce do I use? I love your blog, thanks for sharing your life with us, you are an inspiration! I love the burrito idea, I’ve been meaning to start making my own. Did you make your own tortillas for it? I need to work on making mine that big. Would the chicken fried rice recipe also work in a slow cooker? Holly, I’m just not sure. It hasn’t been tested for that. I really don’t think it will though since the liquids, most likely, won’t evaporate out.